Everyone knows about poison ivy and has at \least heard of deadly nightshade and poison hemlock. We'd nver intentionally plant such things. But we may have toxic plants in or near our gardens and not know it. The Japanese, inveterate gardeners, always keep any poisonous plants in a separte locked garden - or out of their gardens altogether. That's wise; we should do he same. But do we westerners know if what we grow is or is not potentially fatal? Lily of the Valley, with its sweet flowers, is incredibly deadly. Jasmine berries are poisonous. So are mistletoe berries. Oleander is to be avoided as a poisonous plant. My husband actually had to stop someone from using oleander skewers to roast hot dogs and marshmallows. Castor oil seeds are beautiful, but two or three seeds ingested can kill. Foxglove, a plant grown for its huge, showy spiked slowers, has leaves that contain wildly unreliable amounts of digitalis - and can stop the heart. 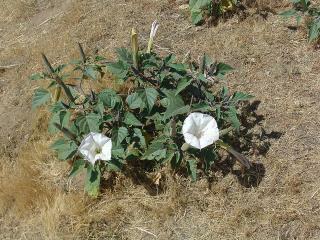 Jimson Weed, found in the wild, is often brought into a garden due to it's showy flowers. It's leaves and seeds are both poisonous andhallucinogenic and often abused by teens, sometimes with fatal results. 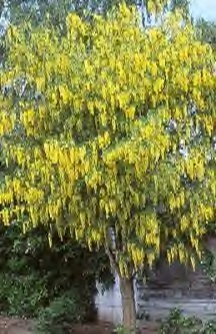 The seed capsules of the beautiful "golden chain"--and ornamental tree--can cause severe poisoning. : excitement, staggering, convulsions and coma. May be fatal. The last time I saw one it was planted in an elementary school playground! Other plants to avoid are (common names) holly, laurels, rhododendrons, azaleas, bleeding hearts (takes a large dose but has killed grazing animals), cala lilies, elephant ears, yews, larkspur, monkshood, and morning glories. Note: this is not an exhaustive list. Even the smoke from burning some toxic plants can hurt you. Here is a really good article on avoiding toxic plants and their effects, and a chart listing poisonous flowers in alphbetical order. Frankly, certain food crops need to be handled with extreme care, too. We all know (or should know) that rhubarb is very poisonous unless cooked. But did you know that elderberries are fine, and cherries are great - but their bark and leaves are poisonous? Elberberry roots are especially bad news. Many bulbs and seeds can be toxic, even if the plant is not. Pansies have edible flowers, but their seeds are poisonous. Hyacinth, narcissus, and daffodil bulbs (and iris corms) can kill if ingested. It goes without saying that seeds and bulbs should be kept out of reach of children. It certainly helps to keep in mind what you're growing, so you know what you have and reserach plants thoroughly before allowing them onto your property. [email protected], Nature, you scary! There is no need to eradicate "poisonous" plants from your garden, just don't eat them. As Sepp Holzer points out in his permaculture book, and I can personally attest to, poisonous plants have a purpose. Watch your animals. Grazing animals only poison themselves when there is nothing else to eat, they know which plants not to eat, or not to eat too much of. The difference between poison and medicine is dosage, we should not be so quick to assume we know everything there is to know about a plant. I have seen this behavior in goats, chickens, and rabbits. Diverse flora creates healthy soil, and every plant has a purpose. The only areas that should be devoid of poisonous plants are those frequented by infants, since they are too young to understand why they should not put eveything in their mouths! As for burning plants, you should be composting or burying organic material anyway, not burning it. Eradicate? I suggested knowing what was on your property and not bringing in anything that was suspect (like Jimson weed.) If you expect small children or grandchildren in the yard, not planting things like foxglove, lily-of-the-valley, and oleander only makes sense. Toddlers will put darned near anything in their mouths. Just off the top of my head, here are a few more. We eat purslane ... very healthy. But it's important to know the difference between purslane (healthy) and spurge (poisonous). According to the accounts of those who have eaten hemlock (and died shortly thereafter, a very painful and nasty death), they taste like wild carrot. In other words, there's no immediate taste indication you're eating anything bad. Stinging nettle. Nasty sting from stem but leaves are edible. Great point about plants. If you are gardening or gathering from the wild, it is smart to learn about what is good for you and what to avoid. Just a note about rhubarb. Cooked or raw, the leaves are the poisonous part, they contain oxalic acid- toxic to the kidneys. Only eat the 'stem' - technically the petiole, not the leaf itself. This is very good to know, and is really worth doing further research on. plant labels don't come with warning labels, so it certainly makes sense to educate yourself. It's common knowledge, some of the most beautiful things in nature are also the most dangerous. Just don't nibble and be aware in case you have children in the yard. Hey, I have morning glories in my yard, too, running up the clothesline pole. As long as I don't eat them, they are beautiful. One plant I left out that we find here in the south is jessamine. It's poisonous, too, and is in the same ecological niche as (edible) honeysuckle in the north. Here is what it looks like.